The baboons look cuddly but can be quite intimidating up close and personal. I have no doubt of their competence to do just about whatever they set out to do. Sometimes they are milling about in groups. Sometimes a lone baboon might be straddling atop a garbage can and peering into its depths. They are athletic and strong and hefty. They appear apathetic to my efforts at reason or small talk. “Evolution is a process that never stops. Baboons who fail to exhibit moral behavior do not survive; they wind up as meat for leopards.”——Robert A. Heinlein, Expanded Universe, (1980), “The Pragmatics of Patriotism,” (1973), address to the U.S. Naval Academy. “There were 140 baboons in the troop, and I came to know every one as a highly distinctive individual. Each one had a particular gait, which allowed me to know who was who, even from great distances when I couldn’t see anyone’s face. 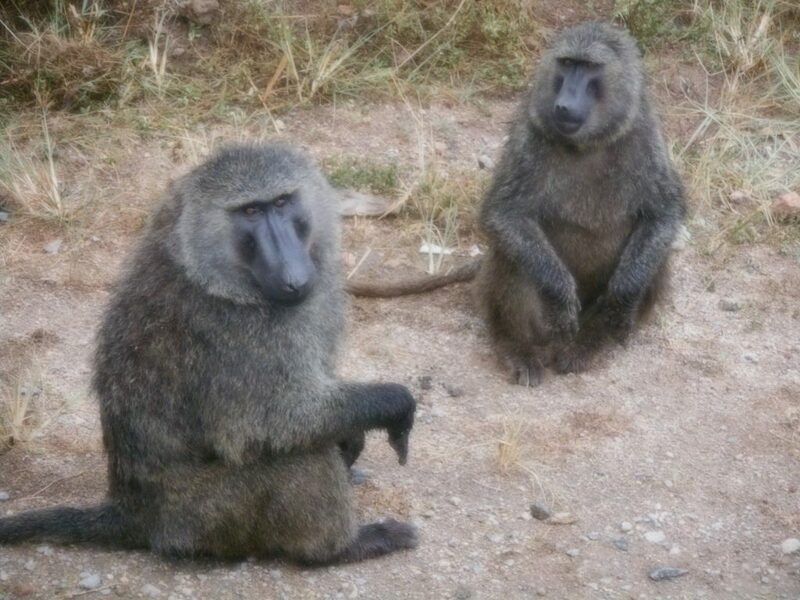 Every baboon had a characteristic voice and unique things to say with it; each had a face like no other, favorite foods, favorite friends, favorite bad habits.”—–Barbara Smuts, Reflections, in The Lives of Animals (Princeton University Press, 1999), p. 111. Here are some Baboon Facts. And here are more wildlife posts.